Tri-City Christian Academy, Kindergarten, Elementary, Middle & High School, is offering significant tuition scholarships to all members and employees of the Greater Rochester Chamber of Commerce. You can save up to 35% off regular tuition costs - depending upon child's grade and space availability. This offer is for new families, first year only, at TCCA. 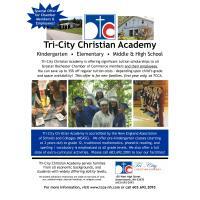 Tri-City Christian Academy is accredited by the New England Association of Schools and Colleges. We offer pre-kindergarten classes (starting at 3 years old) to grade 12, traditional mathematics, phonetic reading, and spelling/vocabulary is emphasized at all grade levels. A full slate of extra-curricular activities is also offered. Call 603-692-2093 or visit www.tcca-nh.com for information and to tour the facilities.